Today I bring you one of my all time favorite recipes. 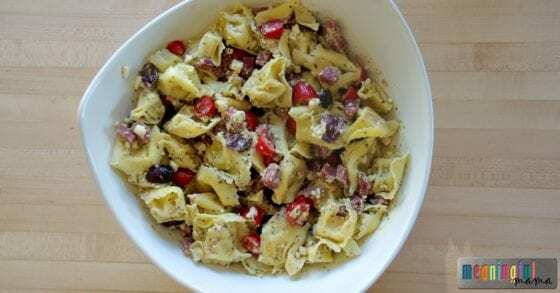 This is my Favorite Tortellini Pasta Salad Recipe, and it is amazing. This is one of my mom’s recipes, and it is one of those recipes that I have a really hard time trying to limit myself on how much is an appropriate serving size. I sample it the entire time I am making it. I pick at it once it is done. I can’t get enough once it is served and leftovers don’t stick around for long. It is one of those dishes that burns memories in my head. I know we had this for my sister’s rehearsal dinner. I know it has become a staple at 4th of July. I’m sure it will become a staple for you too if you try it. Cook pasta according to package directions. 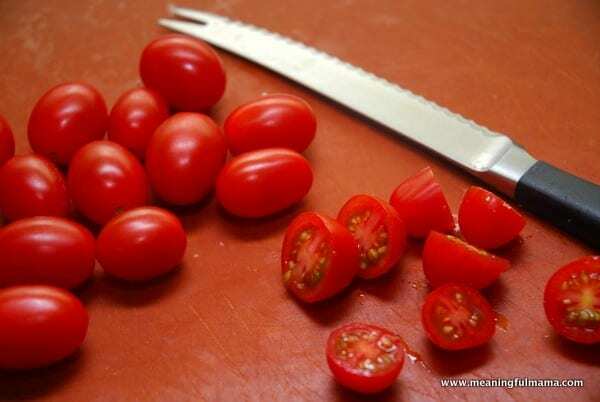 Slice 24 cherry tomatoes in half. Slice olives in half. 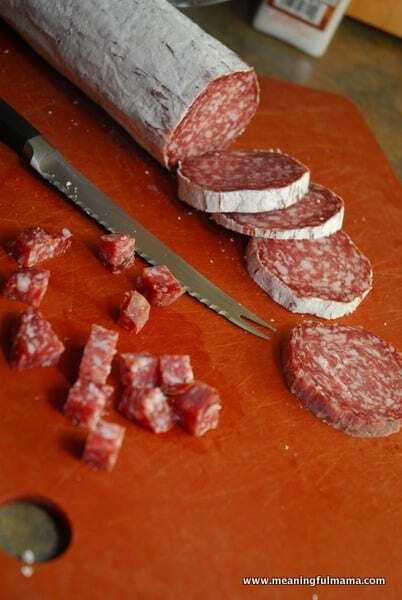 Cube Salami. Toss all of the ingredients that are not part of the dressing together in a serving dish. For dressing, combine all ingredients in a blender. Mix them all until combined completely. Pour dressing over the pasta salad and stir to coat. 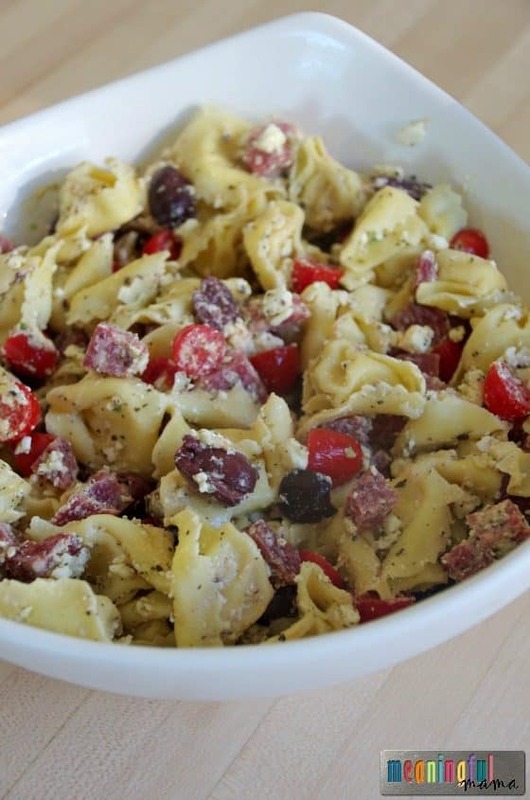 This pasta salad can be served cold, and that is the way I prefer it. I will drain the pasta after it cooks and let it cool before adding the other ingredients. It can definitely be made a day ahead, and I actually prefer it on day 2 when it is nice and chilled. Who am I kidding? I will take this pasta the day it is made too. Can you tell I love it? I wanted to show the size of my cubed salami. I love these beautiful cherry tomatoes. My husband isn’t a huge fan of tomatoes, but he loves this salad and picks around them. 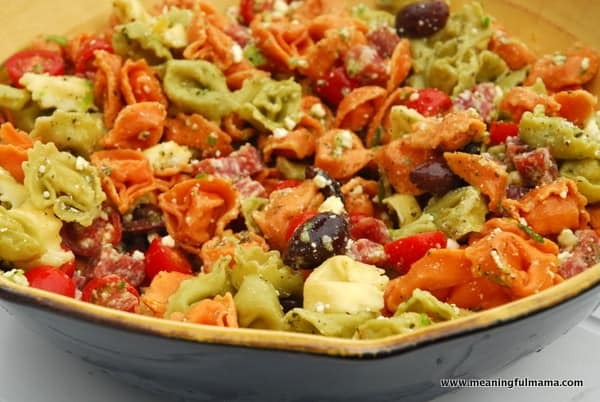 It looks beautiful with a three colored pasta as well as you can see below.